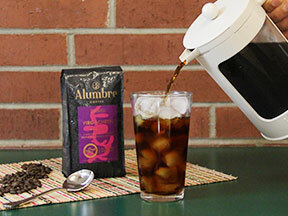 Putting our Alumbre Single Origin coffee to the COLD BREW test! We partnered with our friends at Bodum using their Cold Brew Coffee-Maker—The Bean, and whipped up some amazing cold brews! 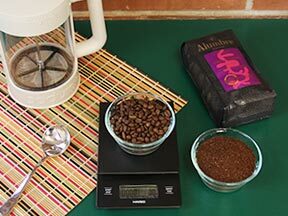 Our tests reflect the perfect combination of coffee and water specific to our coffees; La Minita Tarrazú, Alma del Café de Jardín, Mutu Batak, and Yirgacheffe. On your scale, measure between 130 to 163 grams of coffee, depending on whether you drink your cold brew straight or with cream and sugar. Cold brew requires a coarse grind (like French Press). The grind should resemble sea salt. 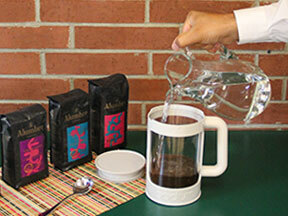 Transfer grounds to cold brew coffee-maker, add 1300 grams of filtered water; We used a 1:10 coffee to water ratio. 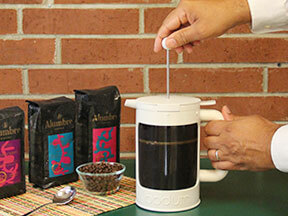 For every gram of coffee, we add 10 grams of water. 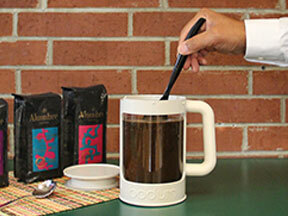 Stir to ensure all coffee grounds are completely saturated. Place lid on and place refrigerate for at least 12 hours – and up to 24 hours. After 12 hours, your cold brew coffee is ready. Remove from fridge and replace the lid with the plunger. Press down. 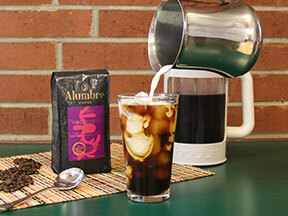 Your cold brew is ready to be served! Pour over ice. Add cream, and or sugar as opposed to a straight brew, make it your own! Our favorites were the Yirgacheffe for Medium Roast AND our Mutu Batak for Dark Roast. Add two scoops of vanilla ice cream. Add your preferred amount of cold brew. Optional: Top with whipped cream and add chocolate sprinkles. Enjoy! Add two shots of whiskey (your choice), and one shot of simple syrup. Top with whipped cream. Optional: sprinkle with chocolate flakes. Enjoy! Mort 2 teaspoons of sugar with your desired amount of fresh mint leaves. Fill ½ of a glass with cold brew. Add sugar, mint, and ice. Mix with milk. Enjoy!